We’ve survived our first month of parenthood! **Laying on the tops of your thighs, right after a feeding, while cooing, looking around and working on her different facial expressions. **Eating…. girlfriend can put it down when it comes to food. **Staring at the little photo gallery above her changing table while she’s being changed. **Kicking her legs while on the changing table… especially her left leg. **Flipping us off while she’s eating. She puts her hands up by her mouth while we’re feeding her (from a bottle) and inevitably she’ll raise that middle finger. We like to think she doesn’t really know that she’s doing that. **She’s starting to smile and we’re certain it’s not gas. Can’t wait to see more of those smiles! **She is a noisy sleeper! We have her pack ‘n play set up in our room and her crib in her room. When she sleeps in our room, I’ll wake at every one of her stirrings. There have been times that I’ve awoken because I think she’s starting to wake up, I’ll look at the clock and lay there waiting. The next thing I hear is her starting to tune her lungs (i.e. getting ready to really start crying) and when I look at the clock an hour has passed! I clearly went back to sleep. When she’s in her room, I don’t hear all her stirrings on the video monitor. **She likes to be held/entertained after eating which makes it difficult for mommy to pump on weekdays when I don’t have help. We’re still working on this and hoping things get better sooner, rather than later. **She’s been extra fussy as of late. There have been many, many crying spells where we just don’t know what to do. Hoping she grows out of this (??). At least we know she won’t be like this when she goes off to college. 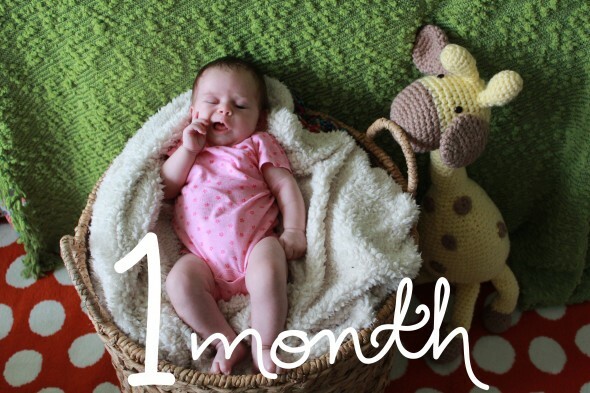 ** For her monthly photos I’ve decided to pose her with this adorable giraffe, my mom crocheted her, along with this basket. I’m hoping to photograph her each month with what she’s currently doing… sitting on her own, standing, etc. For month 1, she’s mastered putting her hands in her mouth. Oh Marsha, … this giraffe is absolutely the CUTEST ever. It is so very special! I LOVE THIS!! I can’t believe mom made that giraffe- too cute and creative!! Will she make one for me? One more day until I meet this little ladybug!